Woodman’s has been a Yankee tradition since 1914, serving generations of New Englanders and guests. 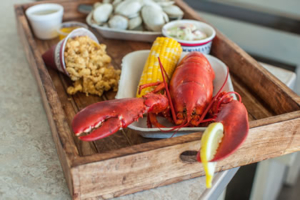 Our experienced clambake crew takes pride in offering the best seafood in New England and our catering services are designed to make your day as easy as pie. No longer did people need to find a beach to experience the pleasures of a New England clambake – he could deliver the experience right to their door. Loading everything onto a truck he drove to his customer’s site where he cooked the clambake over a wood fire in large, specially designed “boiler pots”. His new clambake system gave him the flexibility to travel throughout New England serving groups of all sizes at the client’s location. From parks to parking lots he “drove to them and cooked” – enabling many more people to experience a New England clambake. Today fire regulations demand a switch from a wood fire to propane, yet the same great experience holds true – we come to you – wherever you are. We boast the ability to cook your meal and have it piping hot in a little over an hour! A Woodman’s clambake always starts off with our creamy, award-winning clam chowder. Then we follow it up with a selection of clams and mussels steamed in garlic and white wine with hot drawn butter, fresh lobsters, tender steak tips, chicken or pork ribs, sweet corn on the cob and seasonal desserts. We also do Custom Clambake Menus! Call us at 978-768-2559 for special pricing on parties of 1-34 or 400+. Call our catering sales staff beforehand and we can prepare your clambake to go. We’ll cook your clams, lobsters and corn at Woodman’s restaurant and pack it up with everything you need. You just pick it up and enjoy! Wish you could sit at a table at Woodman’s in person, but you live in California? We understand your craving for Woodman’s, and we’ve come up with a solution for those homesick for a taste of New England. We’ll ship all the ingredients for your own clambake, including our famous clam chowder, anywhere in the continental United States. Do you have a hankering for fried clams? We can ship that too. What’s more, standard shipping is free! Call us at 978-768-2559 or view our Catering Frequently Asked Questions to start planning your next clambake.